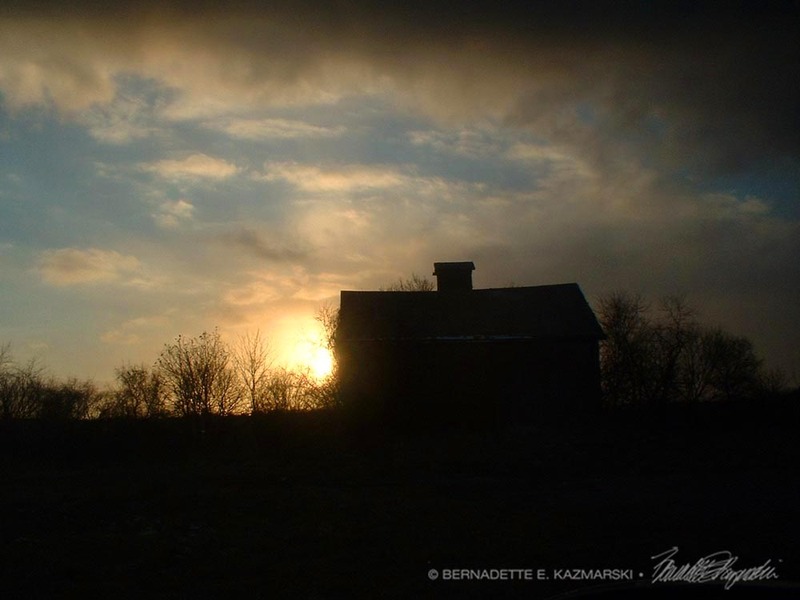 Sunset Behind the Barn, Photo prints are made in archival inks on Epson Silky Photo Paper and signed by me. Even though I grew up in the suburbs, I was surrounded by farms, many in full production as dairy or truck farms growing acres of vegetables still in the 1960s. The nucleus of a long-time family farm was right across the street from our 1950s-era ranch house, the rambling house still standing with the milk house refitted as a rental but the chicken cook housing a few old vehicles and some chickens. The barn came down before I was old enough to have a chance to explore it, but most of these suburban neighborhoods with the curving streets and cars in driveways also had a farmhouse and an old barn somewhere in the mix. I love those old barns, that tend to stand longer than the houses do, being built for brute strength to handle the weight of livestock, equipment and materials. At some point I find them alone and isolated, no farmhouse near, abandoned to the overgrown driveway and fields, but still they hold their ground. I captured this sunset just driving along the road in another suburban development, just at the moment the sun was falling toward the horizon throwing everything into silhouette, a statement of sorts on the disappearing industry and lifestyle that was once the standard of the day. This entry was posted on January 18, 2017 by Bernadette.